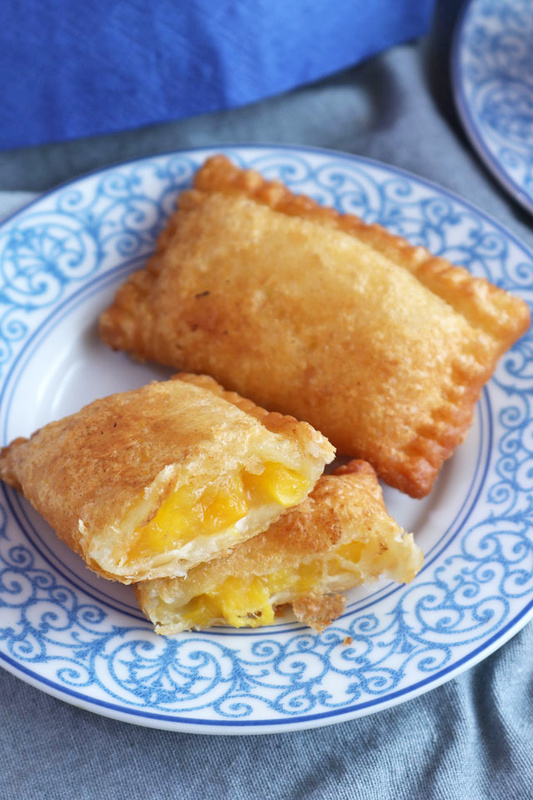 Wake up to a brighter morning with these delicious Peach-Mango Pocket Pies. This is the easy version using ready-made puff pastry sheets. Peach-Mango Pocket Pies or simply peach mango pie is a popular dessert from a fast-food restaurant in the Philippines, called Jollibee. This is our local version of Mc Donald’s. It is truly a delicious treat and one I usually indulged in whenever we go there to eat or even for a take-out. The combination of peach and mango could not be more perfect and the light, crispy fried crust that encloses is enough to make you want to have a bite as soon as it’s heavenly aroma hits you in the face. Believe, I’ve burned my mouth (and esophagus) countless of times from these. I know this recipe is a bit of a cheat but who has time to make puff or flaky pastry anyways. But if I were to make the dough from scratch, then I would definitely do it using this equally easy flaky pie crust recipe. Or I would also use the same dough I use to make my chicken empanada. This Peach-Mango Pie recipe is actually requested by one of our readers. Unfortunately, I am not able to find the message. I’ve searched my emails, blog comments, and Facebook page and other social media and I can’t find it so I hope this reaches you and feel free to comment because it is really driving me crazy when I look for things and can’t find them (*sigh*) Sign of aging, you think? Nah, I am really just forgetful and a mess (of excitement and stress) at the moment from all the things running in my head about our imminent migration back to my homeland! See you soon, Philippines! 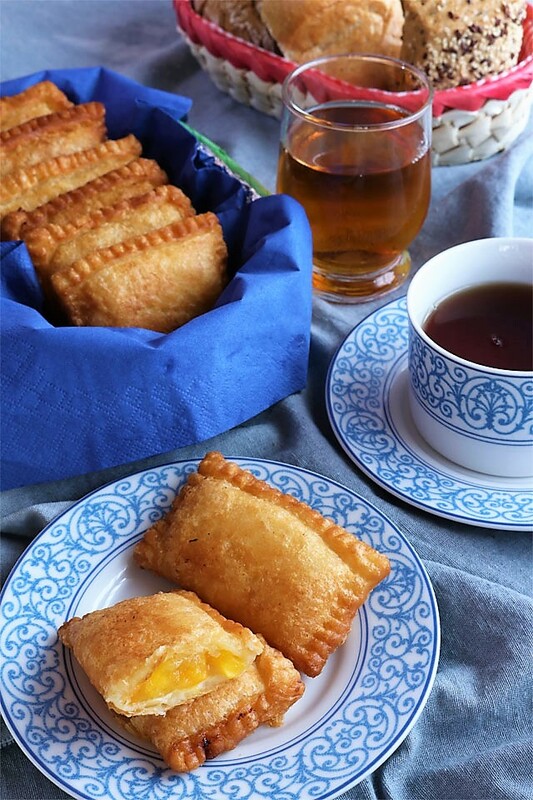 Wake up to a brighter morning with these delicious Peach Mango Pocket Pies. This is the easy version using ready-made puff pastry sheets. In a small bowl, mix the cornstarch and sugar together. 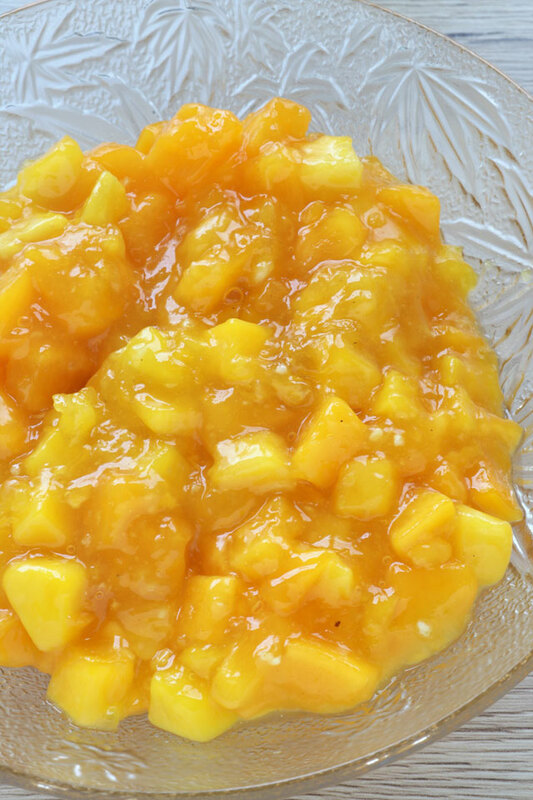 In a saucepan or small pot, combine the peaches, mangoes, sugar-cornstarch mix, salt, and the syrup from canned peaches. Mix well. Bring to a simmer over medium heat and continue cooking for 3-5 minutes or until it becomes really thick like jam. Lay the puff pastry on a flat surface. Scoop three separate spoonfuls of the filling and lay it on top the puff pastry sheets as shown in the photos. Fold the pastry sheet over the fillings and push the edges down to close in the fillings. Cut into three pocket pies and seal the edges. Transfer the pocket pies on a baking sheet or a plate and place in the fridge for at least 6 hours or overnight. Heat enough oil for deep frying over medium heat. 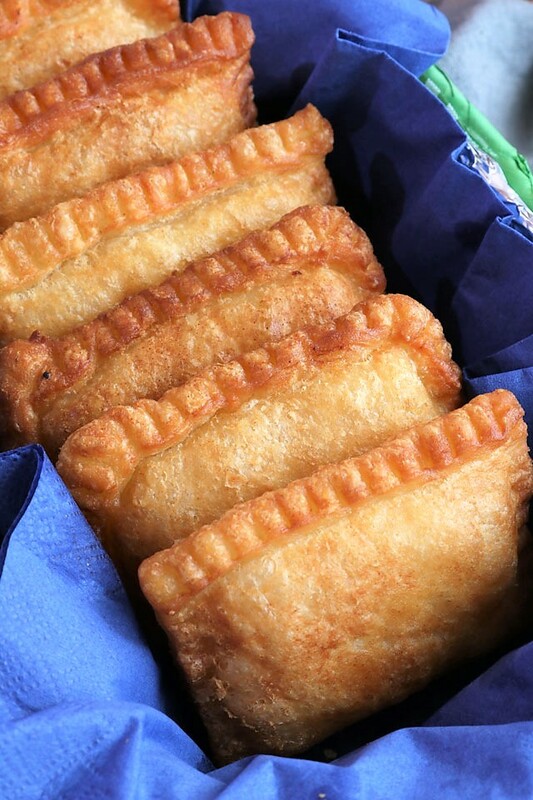 Fry the pocket pies in hot oil while still frozen, 3-4 pieces at a time until golden and crisp, about 3-5 minutes. Transfer cooked pocket pies on a plate lined with paper towels to rid of excess oil. If you prefer to have them baked instead of fried. Place pocket pies on a baking sheet lined with parchment paper in a single layer. Brush each with the egg wash to make them shiny and brown after baking. Poke (3-5) small holes on each using a toothpick or fork to let the steam out and prevent them from bursting open while baking. Bake at 360°F/180°C for 18-20 minutes or until they appear light brown and shiny. Hi Catherine, somehow the taste between fried and baked pies will never be the same, like with donuts. But if you prefer to bake it I added the instruction in the Recipe Notes above. Tried some of your recipes and my friends love it as well as my family and of course me. Will surely try this mango peach pie as buying from Jollibee is driving 6 hours round trip. I am happy to hear you are enjoying our recipes, Elsa. And I am sure you will love these peach-mango pies as well. Yes, you can bake them at 180C for 20-30 minutes or until golden. What can Be used in the absence of a peach syrup? Thank you! I really love to make this i love peach mango pies! Hi Sheena, just replace it with water (3-4 tbsp). I tried this recipe today and it’s as good as Jollibee’s. Our craving for peach-mango pie was satisfied and even my picky 5-year old asked me to save some for him for the next day. Thanks so much for this yummy recipe. I’ve tried so many of your recipes already and they are really delicious and for keeps. I’m an avid fan of your blog, thanks! Hi Elaine, thank you for your very nice comment and since I know the feeling, I will try to add more yummy recipes that might help satisfy with the Filipino food cravings. ? Hi! Can I use fresh peaches instead? Will the recipe change somehow ? Thanks. Hi Grace, Of course, you may use fresh peaches and I do not see any problem with that…maybe a bit of added tanginess from the fresh peaches since canned peaches are soaked in sweet syrup and lost that tanginess but it should be perfect. I have been following your page and have made a lot of good food using you recipes. Just ine question on this pocket pies. If i bake these, is it necessary to have them frozen or i can just bake them right after making the pocket pies. Hi Cherry, Yes you can bake them after making them but they are best fried and I find that freezing them before frying helps to keep the shape. Hi. Thanks for posting great recipes! This one is in my fave list. Hi Mia, I am pretty sure you can bake them too. Bake at 200°C for 10-20 minutes or until the pastry starts to puff then lower to 180°C and bake until golden and cooked through. Hi, just ordered the ingredients and I am very excited to make some! I just have one question. If I make a batch and store it in the freezer and, just gradually consume it (like fry 1 or 2 pcs at a time), how many days or weeks can I keep it frozen before it spoils? Thank you. I would say it should last a couple of weeks if it is stored properly in the freezer. I suggest you divide them in smaller quantities so you just take out from the freezer what you need. Can’t wait to try this! It’s added to my “must make” list of your recipes. I am also a Filipina living in Germany for almost 3 years now, with my husband and a 2 year old daughter.. and boy am i glad to found your page! This peace mango pie is what i have been craving for.. the jollibee version.. I have only tried apple pockets. but i have baked them.. i would like to ask if you tried this peach mango pie by only baking. and did they have the same yummy taste as the fried version? by the way, do you have a youtube channel? Thank you so much for the recipes! Hi just want to clarify. When outting back in the fridge meaning freezer or refrigerator inly? Coz u said while frozen fry it? Hi Fercy, thanks for mentioning that. It should be in the freezer. ???? Thanks for this recipe! I actually made it couple of times already and me and my husband loves it! He has been asking me to make it pretty much everyday! Sweettoptg problems! ???? I can just make a bunch of em and keep in the freezer n fry it whenever! I should start doing that.. and my hubby asked me to add creamcheese in one of em he likes it too!! ??????????????? ?